Search contents field. Use commas between terms. This project is, in a way, related to the Paper Tape Archive project that I did back in 2003. In that project I acquired about 200 reel-to-reel tapes from an estate and went through them to document what was on them. I found numerous off-the-air recordings that are now shared on the site linked above as well as many live recordings. The live recording were of two types: family/personal recording and various recordings made around Billings, Montana. The personal ones were digitized and shared with the family. Some of the remaining ones are on the web site and others were shared with relatives of people who were on them. About a year after I completed the Paper Tape Archive, I stumbled upon another batch of tapes at an estate sale. Since there were so many, and there was no way to determine what was really on them, I bought the lot in hopes of finding at least a few things that were interesting. Along with the tapes I picked an in Akai X-2000S, one of the few tape machines that plays reel-to-reel, 8-tracks, and cassettes. Going through the about 600 tapes was a daunting endeavor and one that I've kept putting off. It seemed too overwhelming and, as I tend to dive into a project and do nothing else until it's completed, there just wasn't the time to devote to just to this job. Now, about 15 years later, I have come up with a way that breaks the job down into bite sized tasks. My plan is to go through the tapes, a reel at a time, a week at a time. I might miss a week here and there or I might do more than one reel per week, but this should, at least, move the project along, even though it may take a few years. The tapes themselves are a real mix of brands. Most are on 7” reel but there are a few 5” and 3” reels in the mix. Sometimes the brand of plastic reel matches the brand of the box but many times it does not. Some of the taps are acetate, an older type of tape, and some are on a polyester base. Many of the tapes are labeled, many are not. The labeled tapes indicate either recordings of broadcasts or copies of LP records. The broadcast labels indicate they are mostly religious recordings. Some are political. There are some commercially pre-recorded albums, mostly of the easy-listening genre. I decided to try and go through the oldest tapes first so I sorted them by tape type, placing the acetate tapes in the first pile. An acetate tape can be identified by holding it up to a light. An acetate tape will allow some of the light to pass through while a polyester tape will not. My workflow has taken some various twists and turns but I have now got it pretty much standardized. As I write this I have about 50 reels done and am familiar enough with the boxes and the various labeling methods that I was able to sorted out some of the tapes hoping to get to the oldest first. 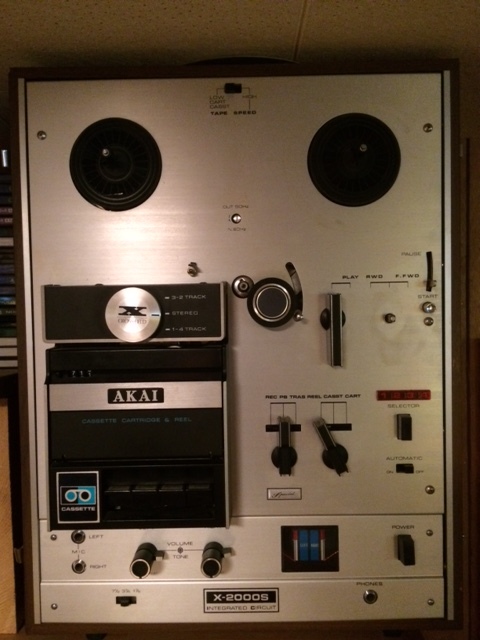 I start by placing a reel of tape on my Akai GX-260D reel-to-reel tape deck which I have had for about 30 years. It was a gift/trade I did with a friend of my father's who purchased it while overseas in the navy in the early 1970s. It is a tank and runs steady and quiet. It is stereo with auto-reverse and has an output level control on the back panel. I connect the line-out on this to my computer using a ground-loop isolator (Radio Shack 270-054A). The computer I was going to use is my MacBookPro using a Griffin iMic that brings audio in through the USB port. It worked great using Audacity but I started getting LOTS of drop outs on longer recordings, which is something to do with the way Mac does incremental saving. I was unable to resolve this so I switched to my Windows machine. The Windows machine is a 10-year old box I build from parts and, like the Akai, is a tank and just keeps running. It has a Pentium 4 processor with 2 gigabytes of RAm and runs Windows XP with Service pack 3. It has 4 hard drives, 2 internal and 2 external so there is plenty of storage. For recording software I am using a very ancient version of SoundForge, Version 4.0. It is what I purchased eons ago and it works so I use it. I have Audacity but like to use it for post-processing. More about that later. The cable from the reel-to-reel machine, through the isolator, is patched in to my soundcard's line input. I use the Windows built-in recording input panel to adjust the recording level although I occassionally make adjustments using the output level control on the tape player. SoundForge is set up to record at 44,100 Hz, 16-bit, stereo. I use SoundForge's "calibrate" function to do whatever it is it does that sort of presets the input levels or does the DC adjust or something like that. With the reel ready to go with its playback speed set at 3-3/4 ips, I press the record button in SoundForge and then press "Play" on the tape machine. I monitor the levels for a bit and then let it play until done. When the tape runs out the Akai stops. Sound Forge continues to record until I stop it. and it is saved as a .wav file. I flip the tape over and repeat the process for the other side. I load the original file into SoundForge and listen to what I have. In most cases the tapes are made in 4-track mono, meaning that there is separate content on the left and right channels. More challenging are the many recording made at 1-7/8 ips. I have learned that this was done by copying the content by playing it at 7-1/2 ips on one machine and recording it at 3-3/4 ips on another machine. This was an analog approach to "file compression." I have one tape machine that does play at 1-7/8 but instead of dragging it out, I adjust the speed digitally using Audacity. and save it to the flash drive and move it back to the Windows machine. Once I have the speed adjusted, if required, I open the sound file back up in SoundForge. I can now scroll along and listen to the content with the goal to break all individual recording segements into separate files. Sometimes I can find the breaks by seeing a change in the look of the sound print and other times I can go by the length as most broadcasts are in quarter hours or multiples of that. Sometimes I just have to hunt. Once I find the beginning and the end of a segment, I copy and paste it into a new file window. I then apply any adjustments that might improve the listenability. Common ones are to use the equalizer in SoundForge to drop some of the lower frequencies and boost the higher frequencies on the recordings that underwent "analog compression." Occassionally there is a strong 60 Hz A/C hum and I have used the equalizer to reduce that. I also adjust the volume if it is too low. If it was too high and "brickwalled" I rerecord from the original tape. If there is a distracting amount of background noise, usually static, I will use the "Noise Removal" feature in Audacity. With this tool I sample a bit of the noise and then the software removes it from the file. It does a pretty good job although overuse can result in a "flanging" effect. If the file is large, I will move to my MacBookPro for this because that machine is faster. Another adjustment I might make are to reverse the sound file. This is because some of the tapes were made on a 2-track tape machine. When played back on my 4-track machine the way the tape heads are lined up will allow me to hear what is recorded on the other side, but reversed. Usually this is just duplicate material but on occasion I may have original material that was recorded over with a different machine type so I always want to check it amd make sure. If it needs to be reversed, I do that in SoundForge. Reel number: the first reel was 001. Since I am going to go through about 600 reels, I prepend zeroes so that the files will automatically sort in numerical order. Item number: this indicates numerically which position on this side of the tape the segment is; it prevents there being duplicate filenames and also helps with the sorting/showing the files in sequential order om the computer. Date: 2 digits each for year, month, and day. When I reel is done, I have the raw files that came from the original transfer from tape to computer and the individual segments, all in the .wav format. I convert these to mp3 using AudioCatalyst, a program I bought many years ago when most audio software did not include exporting to mp3 as an option. I don't go crazy with compression setting since this content is not high quality audio in the first place. I encode the .wav files at 32kbps which gives me a good audio quality and a small file size. After converting to mp3 I delete the original .wav files, save the raw files in a "Raw Reels" directory and the recording segment files in a directory bearing the reel name. During the process where I am breaking the recordings into separate segements, I attempt to document the recording as much as I can. I will admit that I do not listen to every minute of every segment but I generally listen enough to make notes on what the file contains. I use the word processing tool in OpenOffice to write this notes. Under each segment's notes I paste in the filename. Aside from the segment's title, the most important piece of information is the date. Sometimes there is a label on the reel that is helpful. Sometimes a voice comes on the recording and states the date. Other times I listen to the recording for clues. For example, if there is something topical mentioned, particularly in a news show, I will look up that event and try to establish the date. If I cannot find a date, one might be guessed by looking at the other recording on that reel, however, I have some reels with documented dates that are 5 years apart. If I do not know the date, I do not include it in the filename. In the notes I take on each segment, I try to include just what is on the tape, however, I will sometimes include information to add context to what has been found. I make a strong attempt to NOT to editorialize. That would be for another project and not the purpose of this one which is to explore and share a bit of local and national history. If I find a photograph or a link to related information I will include it with my published notes. I also take photographs of the boxes, the reels, and close-ups of any labels. I shoot these with my iPhone and make any adjustments to them on my Windows computer. These images have a naming comvention that allows my software to retrieve and display them easily within the web pages. It was an obvious choice to publish the results of this project online. There are certainly many fans of Old Time Radio who might be interested in the broadcast recordings but those interested in local history would also find some valuable information on what is found in this collection. The easiest way to get it out there is on the World Wide Web. As I already had a web site (www.otrannex.com) it was easy to just add another directory to it and make a link to that. What did take some effort was to decide how I wanted to automate what would be a long-term project. I ended up writing much of the web site in the PHP progamming language and added a mysql database behind the scenes to keep things orderly. When a user goes to the site, a program grabs the most recently entered reel and pulls up the information about it and formats it within the web page. The sound files are kept outside the database itself however, the filename, the notes, and the reel notes are kept in various tables in that database. Those filenames, explained above, are disassembled and displayed under the notes on that file. I added a search function which looks through the notes and produces a list of files that match those results. When I am ready to publish a reel, I log in to the administrator portion of the the web site and use the various tools I have written that let me enter each segment's notes and file name. I can add notes about the reel, such as mentioning any problems I had retrieving ther recordings from it. While I can use a feature iI included to upload the files through this adminsitrator page, I usually just use an ftp client because it is a straight "drag and drop" to get them to the web server. The last step it to retrieve the play time for each file and enter it into the database. I was able to automate this as I found a free program that will look at an mp3 file and return its play time. I reformat that result into one I need for my database. This utility does this for every mp3 that doesn't current have a time for it in the database. I check the web page that lists the reel contents and make sure every file has a time. If it does not, that usually means that the was a naming problem which is easily fixed. So, where did these recordings come from? OK, there was a guy named Jim, a barber, in Billings, MT who made many of these recordings. He appears on many of them. He recorded live, that is, while something was taking place, and off-the-air. On one tape he states that he started doing this in 1947 on a wire recorder before transitioning to tape in, my guess, 1952. Jim recorded many conversations in his barber shop while he was cutting hair. I have titled these Babrber Shop Talk. I do not know if the cutomers always knew they were being recorded. Jim passed away in 1990. The tapes were given to local thrift shops. I consider that move by his estate as releasing them in the public domain. Another gentleman frequented thrift shops looking for cheap recording tape and he bought the tapes. He passed away in the early 2000s. I purchased the tapes from his estate sale. At the time of this writing I still have many tapes to go through. While the broadcast recordings were my initial interest I have also become interested in the life and times of Jim the Barber. Going through his recordings I get a picture of who he was, what interested him, and what he found important enough to save. In way, it is like looking through a family photograph album where what was important to the family was preserved. I am also learning quite a bit about Billings, MT from the recordings as well. There are many references to things and places past. Not being a native here, I rely on old newspaper articles and the memories of friends who might remember those times.